We spent the weekend alone together. 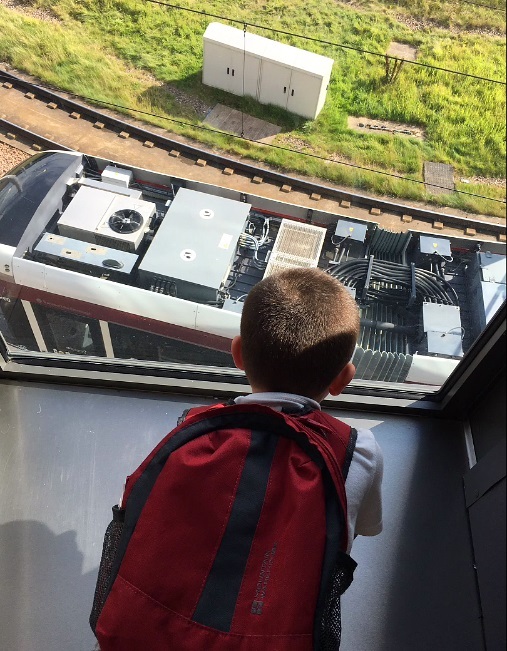 After a tiring first week of school, On Saturday I took him to our capital city, Edinburgh as a treat. We spent 12.5 hours in, on or admiring transport. Riding on the city tram, trains (a particular type he had been longing for), buses, and watching aeroplanes. I planned our route and sequence of stops, and then he devised a better one. I tested him at the main station. It’s big, it's busy. 20 platforms handling 21 million passengers per year. I bought the ticket and worked out what time we would be catching a train. Armed with the information about the next stop and the time, I challenged him to go and read the departure boards, work out which train it was, get the platform number, then find the platform and take us there. He succeeded perfectly. Then we went to a Chinese restaurant he specially requested - where he ate fries 🍟 and onion rings! It was a buffet, so I had not much choice but to leave him alone at our table while I got my food. Towards the end of the meal the lady on the next table leaned over and told me what a delight to see a child so beautifully behaved. We're often told that. Despite an epic Saturday, on Sunday he wanted to see trains 🚂 again at the local station; we ended up staying several hours. He read all the information boards, decided which trains to see, found the platforms. We went over the bridge and under the underpass. We went up the stairs and down in the lift (elevator). He predicted the engine types, and as the trains came passing through the station he read the name plates to me and decided if he'd seen them before. "Sir John Franklin", "City of Manchester", "Treaty of Union" and so on and so on. He told passers-by all about them, whether they wanted to know or not! He observed all the safety rules, even though his boundless enthusiasm was constantly threatening to break into uncontrollable excitement. And that's when it hit me. My little boy is only four; he is locked into his passion for trains, but he just keeps amazing me. A tear rolled down my cheek. I was confused, I didn't really know what emotion I was feeling. My wife pinpointed it later for me: just an overwhelming sense of protection, not just for now, but probably for all that is to come. I want to know what's happening! So there was I, cutting the grass. And there was he, slapping the glass. Making grass look so short and so green. Where dad chucked the grass cuttings in. Doing jobs where I'm usually bored. A young boy's complete admiration. One day daddy won't seem so clever. I haven't written much during the first year of bambino's life, so this post comes a bit out of the blue. But then we're about to embark on a big new chapter (more later) so maybe now's the right time to start filling in the blanks. You can't possibly encapsulate over 12 months of parenthood in one short posting, but this post is about this weekend, which was magical. 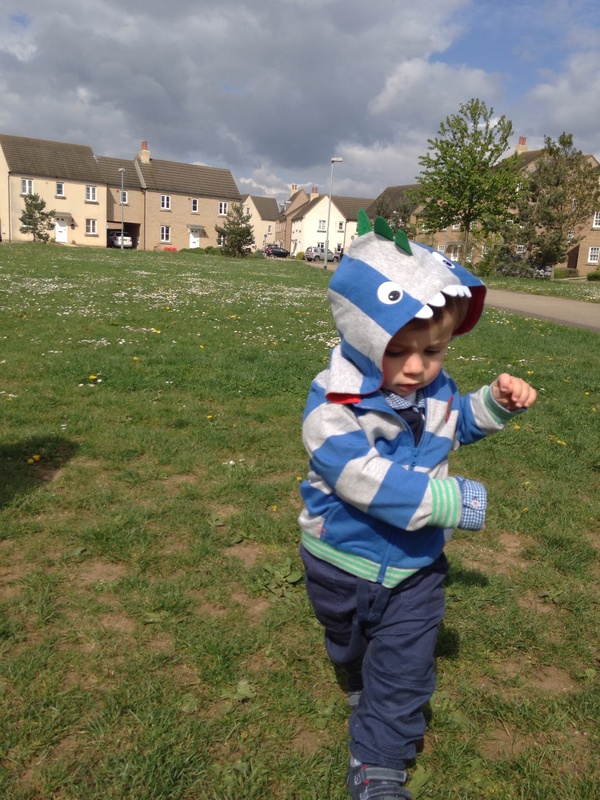 After months of threatening, last weekend our wee man finally decided to start letting go of daddy's hand and begin walking solo. Tentatively at first. Of course. But by this weekend his confidence, and the weather, was good enough for him to go it alone on the green outdoors. This was firstly significant for the fact we are leaving, so I'm pleased he got chance to use the green. I'd always known when I moved here it would be a brilliant place for kids, so in fact a part of me is a little sad we'll be leaving it behind. But secondly this was significant because it was also quite emotional. As a developmental step, our wee baba is now capable of being independent outdoors - that's a pretty big deal. And quite amazing to see him take his first few exploratory steps in the great wide open; and absolutely loving it to boot... Soaking up the fresh air and the crunch of ripe grass underfoot with excitement and abandon. If he loves the outdoors, he's going to love what's coming..
Well, it's been quite a two weeks! Bringing a new homo sapiens life into the world is, of course, one of the most literally life-changing things you can do. Especially since once you've done it, you have to keep it fed and watered! For about 20 years! About three days in I went through a shaky moment after 2 sleepless nights (3 for Helen, who had a night in hospital). But anyone that's seen my Facebook timeline will know I am quite the doting father, totally smitten with our wee son, Edan. This was just shock to the system and a sort of instinctive panic, that if this was how it now was, I might not cope, especially once back to work. But I will, because it's a team effort and it will get easier. Which leads nicely into mentioning Helen, who is a remarkable mum. Her training as a nurse is invaluable and she has a gentle and confident touch that is reassuring to both baby and dad. And through propped-open eyes she retains a vigour and commitment that belies the fact she is recovering from a major operation and has had additional complicating ailments to deal with. Edan is blessed to have her as a mum. We've already experienced the fretfulness of having to get medical intervention; and then the angst and guilt of having to administer regular medicine to a little boy who doesn't understand why he is forced to drink something so luminous and foul tasting. (Quite naturally he's decorated a few choice locations with it). I found myself looking into his teary eyes this evening saying 'please don't hate me' and experiencing for the first time that paradox of 'doing something horrible because I love you...' Henceforth, I expect a lifetime of such confusion. I suppose this underlines why becoming a parent can be so significant; affirming, yet daunting in equal measure - because there is so much new to experience and it all comes at you like a sonic boom. 2 weeks in, and despite a few missed showers and shaves, the initial anxieties have gone and regardless of the sleep deprivation and unending whir of the washing machine, the joyfulness is emerging. A good deal of that has already come from the photography - i can't say Edan is the most co-operative of models, but he's certainly photogenic and keeping me on my toes. Another heart-tugging moment was my first 'FaceTime' tonight while away from home - into a captivated pair of deep dark eyes that followed my waving hand 130 miles away. Lumpy-throat-moment. There are so many more of these moments to come. Well - what a day. Is it dram-o-clock yet? The most important thing is to thank everyone that has sent their good wishes by almost every means possible barring winged beast. I've struggled to keep up at times, and as a bare minimum at least have tried to "like" facebook messages, if not reply more fully. If somehow in the collage of today's events I have missed a direct thank you, please consider yourself now thanked. I never quite realised how surreal that transition from in-utero to ex-utero would be - it feels like such a pivotal moment, rather than merely a continuation of the predicted time-line. Well, it did to me. The day was not without its anxiety and Helen can only be commended for her wilful endurance. At last you are here wee man. What a journey it has been; what emotions we have ridden along the way. We could not be happier. You are our beautiful miracle child and we will love you always. Dance and laugh like tomorrow depended on it.